If you're looking for a smooth, velvety soup with the earthy flavor of mushrooms, then a mushroom bisque is the perfect meal. This flavorful creamy soup is tasty as a lunch or starting dinner course in fall or winter. Make this rich, creamy bisque for your next meal. The recipe serves 6. In a soup pot, melt 1/4 cup of the butter on medium-high and then add the onions, mushrooms, and leeks. Cook, stirring frequently, until translucent, about 4 minutes. Do not allow the vegetables to brown. Add the flour and cook until it is tan, stirring frequently, about 3 minutes. Add the chicken stock slowly, stirring constantly. Bring the soup to a boil. Reduce the heat to medium-low and simmer for one hour, stirring occasionally. Puree the soup in a blender in small batches. Return it to the pot and whisk in the cream, Cognac, and remaining butter. Serve warm, drizzled with truffle oil, if desired. 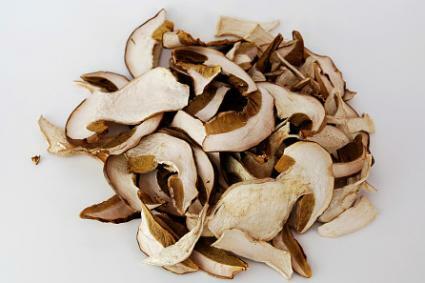 Dried porcini mushrooms have a meaty, earthy flavor when reconstituted. You can find them online or in the produce section at the grocery store. The recipe serves 6. Put the dried porcini mushrooms in a heatproof bowl. Pour the boiling water over them. Cover and set aside for at least 60 minutes to allow the mushrooms to soften. Wash, trim, and chop the fresh mushrooms. Set aside. Heat two tablespoons of the butter in a stockpot over medium heat. Add the shallots, salt, pepper, and rosemary. Cook over medium heat, stirring often, until the shallots begin to soften, about 4 minutes. Add the celery and continue to cook until the vegetables are translucent, 3 to 4 minutes more. Cook, stirring frequently for about 5 minutes until the liquid reduces by half. Drain the porcini mushrooms, reserving the soaking liquid. Chop the porcini and add them to the pot. Increase the heat to medium high and cook for 1 minute. Pour the mushroom soaking liquid into the pot, leaving any sediment out. Add the potatoes, Marsala, and chicken stock. Simmer until the potatoes are very tender, about 10 minutes. Remove from heat and allow the soup to cool for 10 minutes. Puree the soup in the blender in small batches. Return to pot, add the cream, remaining 4 tablespoons of butter, and the thyme. Simmer, stirring constantly, for 5 minutes. Taste and adjust seasonings as desired. Remove from the heat. Add the Madeira and serve immediately. The best mushroom bisque begins with fresh, quality ingredients. Mushrooms should be plump, clean, and firm. Organic items should be used when possible. Using the best possible ingredients will ensure the most rich flavor. You can use any type of edible mushrooms; however, the best mushroom bisque is created by using a combination of several varieties. This adds layers of flavor and creates dimension in the finished soup. Chicken stock is another important ingredient in bisque. It is important to get a good quality stock that is salt-free. This allows you to adjust the seasonings to your taste. Organic and free range stock is first choice because of the superior flavor. You can also use homemade chicken stock. Heavy cream contributes to the smooth, velvety consistency of the bisque. Don't be tempted to save grams of fat by using anything else. The result will not be as flavorful as when you use cream. There are differences in creams as well. Be sure to use heavy cream, rather than whipping cream. Heavy cream lists only cream and perhaps a stabilizer as ingredients. Whipping cream may be made from skim milk, stabilizers, oils, and other ingredients you don't want. Sprinkle chopped green onions or chopped chives on top. Float a large crouton sprinkled with grated Parmesan cheese in the soup. Sprinkle the soup with crumbled, cooked bacon or pancetta. Drizzle a little extra-virgin olive oil over the top. Saute some sliced mushrooms and sprinkle them on top. 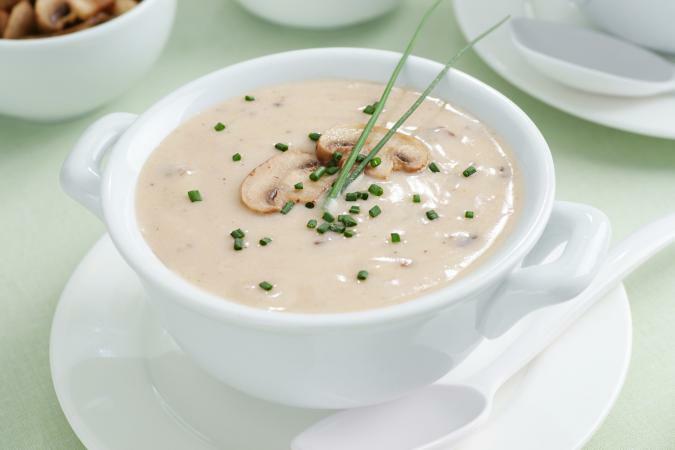 Mushroom bisque soup makes an elegant first course or a delicious light lunch. Once you've mastered the basic technique, there are numerous variations. Homemade mushroom bisque is an easy soup to master and a fantastic addition to your table.